Order in next 14hrs 19mins for next working day delivery. Alluring grey gradient lenses are held in by the black acetate frames of these sleek DVF sunglasses. The lightweight and resilient frame makes for a comfortable wear, as well as a stylish fashion statement. 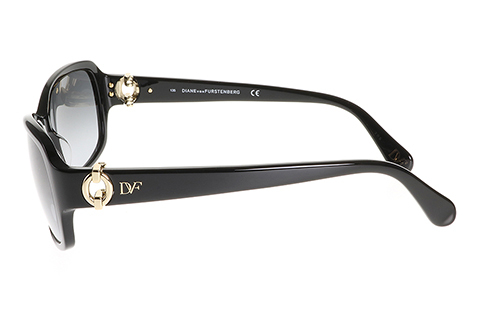 These DVF 592S Faith sunglasses feature full rims and a luscious matte black coating that stretches across the gorgeous rectangle frame. A must-have this summer, these women’s sunglasses proudly display the celebrated fashion designer’s brand letters in intricate gold gap detailing at the temples. Enjoy next day delivery when you shop online at FeelGoodContacts.com.